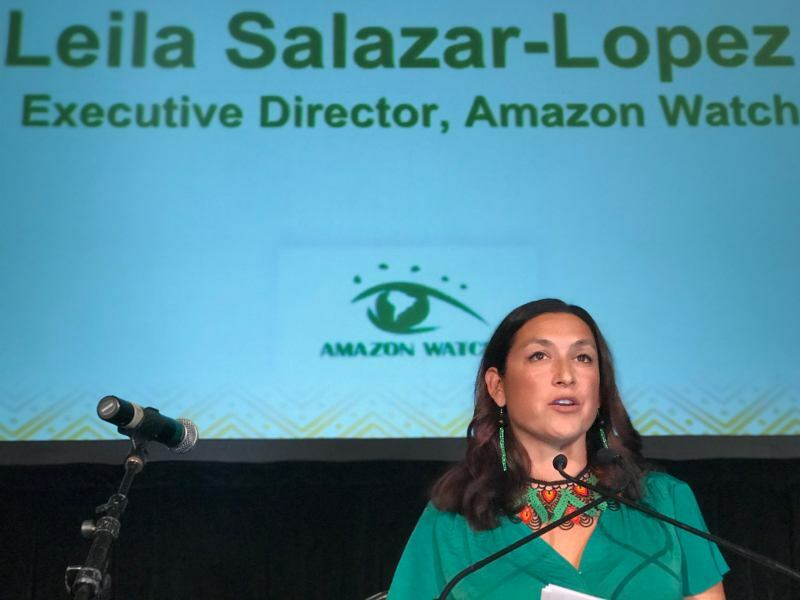 AMAZON WATCH » We're Not Giving Up On Our Climate! Our Future Is Depending On Us! We're Not Giving Up On Our Climate! Our Future Is Depending On Us! In the days surrounding the COP22 round of climate talks in Marrakech, Morocco, which concluded on Friday, the publication of yet more scientific studies further proved the urgent need for a rapid response to climate change and the global catastrophe it portends. Yet even as world leaders debated plans to implement last year's COP21 Paris Agreement and climate activists marched and clamored for tougher action, US president-elect Donald Trump continued to deny the reality of climate change and threatened to pull the US out of the agreement when he takes office. 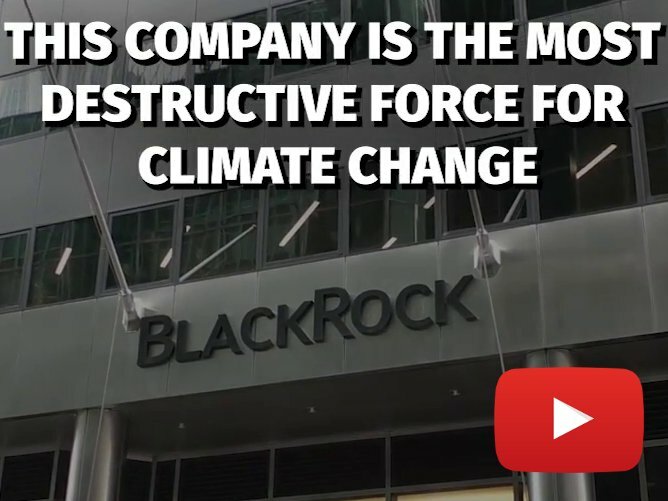 Nonetheless, organizations, networks, and movements from around the world "refused to be overshadowed" by Trump's threats and denial, calling him "the face of the broken economic system that has caused climate change: the concentration of wealth, lobbyists and corporate interests." Many countries also vowed to push forward with Paris Agreement plans, despite Trump. 198 of them, in fact. Even more important, 47 of the world's most climate-vulnerable countries, including Bangladesh, Ethiopia and Costa Rica, also promised to move to 100% renewable energy "as rapidly as possible." Other announcements were made by countries supporting water and food security in vulnerable regions, and cities and states making their own, sub-national commitments. However, the commitments made by governments in the Paris Agreement and at COP22 are not enough to sufficiently take us off the current destructive course. While the agreement caps global temperature increases at 1.5 degrees Celsius, the current plans put forward by governments will not actually meet this cap. Governments must do better. It is not enough just to reduce emissions; all fossil fuels should be kept in the ground, and a just transition to 100% renewables must be made as soon as possible. Furthermore, wealthy countries must take responsibility for leading those changes, given their disproportionate contribution to climate change and their greater access to resources. Although an "adaptation finance" system to provide funds for less developed countries to transition to renewable energy was widely discussed at COP22, few substantial commitments to fund it were made, with many of the richer countries claiming they lack the resources. "This doesn't ring true," said Alex Doukas of our ally organization Oil Change International. "Some of the world's wealthiest countries – the G7 plus Australia – continue to fund fossil fuel exploration and production at a rate more than twenty times higher than their contributions to help developing countries adapt to climate change. If governments want to get real about implementing the Paris Agreement, they need to stop funding fossils and start funding solutions." Governments must also do better to address the needs and rights of communities most impacted by climate change – like those living in deserts, small islands, and in hurricane zones – and of indigenous communities around the world. As our friend Osprey Orielle Lake, Executive Director of the Women's Earth and Climate Action Network (WECAN) said at the close of COP22, "Peoples' movements worldwide are clearly stating that government action is not nearly ambitious enough given the urgency of the climate crisis we face. The UN itself confirms that under the Paris Climate Accord, which calls for action to limit global temperature rise to no more than 1.5 degrees Celsius, current commitments by governments take us to a catastrophic 3-degree rise. This is a reality that the Women's Earth and Climate Action Network (WECAN) and our frontline, grassroots and Indigenous women allies across the world simply refuse to accept. Developed nations of the world continue to skirt their historic responsibility to act and provide meaningful support to those nations who are experiencing the life or death impact of the climate crisis now and who have contributed the least to the accelerating degradation of the Earth's ecosystems." And even though studies continue to demonstrate that indigenous community control of land is one of the very best ways to protect forests and combat climate change, particularly in places like the Amazon, indigenous rights were not included in the final and legally-binding text of the Paris Agreement. Therefore, indigenous communities and organizations from around the world traveled to Marrakech to demand that governments take their needs and proposals into account, and it does appear that this understanding is gaining wider acceptance – even the president of the Inter-American Development Bank publicly promoted indigenous control of territories as a necessary solution to climate change. COICA, the Coordination of Indigenous Organizations from the Amazon Basin, traveled from the Amazon to Marrakech with an extensive delegation of indigenous leaders – including many of our close partners from Ecuador, Peru and Brazil – to call on all world leaders to respect indigenous land rights as part of the climate change solution. 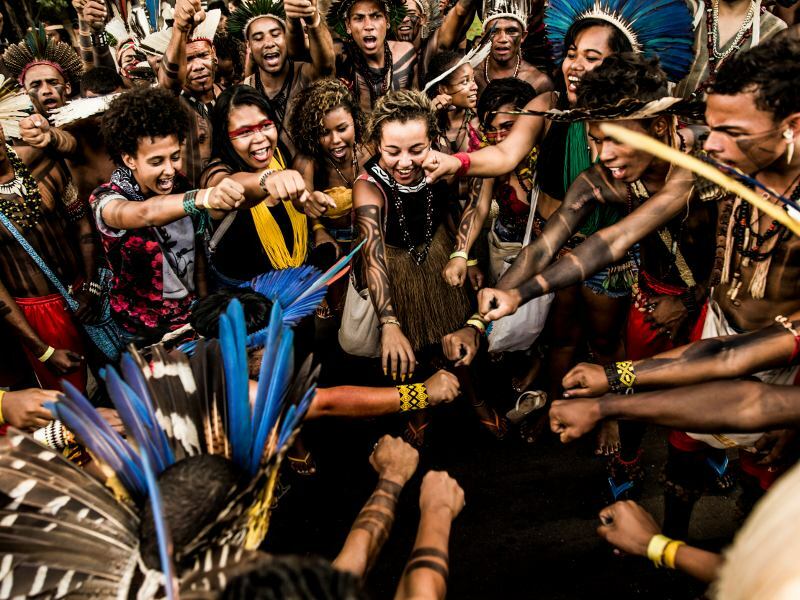 The "Guardians of the Forest" brought drums from across the Amazon to sound their call. While Amazon Watch staff did not travel to Marrakech for COP22, we were there in spirit via support for indigenous allies including the indigenous women's delegation of "Chaski Warmi de Abya Yala" – indigenous women messengers from across Latin America who called on the United Nations and all people around the world to listen to the voices and solutions of indigenous women on the front lines of climate change. They say, "We are the messengers of the voice of Mother Earth. We carry the voice of indigenous people who are struggling in the defense of nature, their territories, and their ancestral lands." 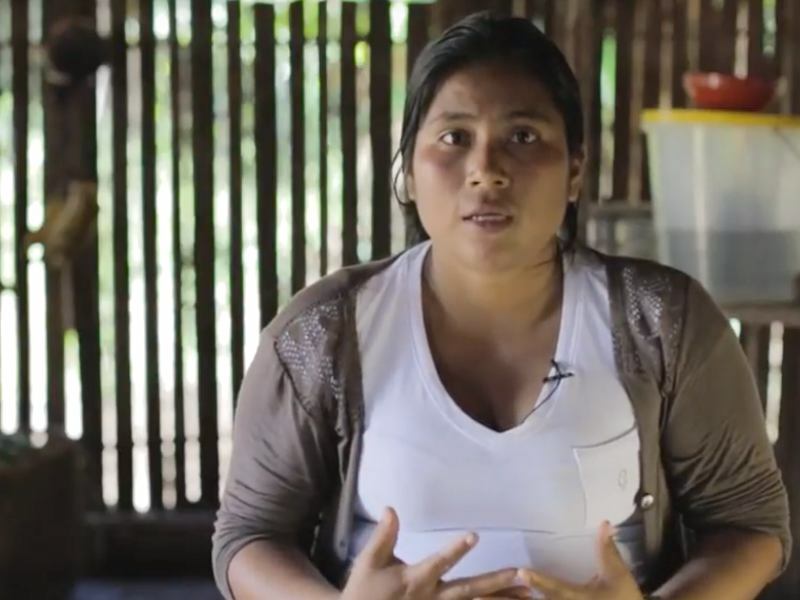 "Of course we want development," said delegation participant Blanca Chancosa of the Ecuadorian indigenous federation, CONAIE. "But not the type of development that abuses the forests, air, water, and land. We want our own model." The indigenous women of Chaski Warmi called specifically for keeping oil in the ground, and the creation of Annex 0 countries to acknowledge the contribution countries that have not historically caused climate change. We indigenous people depend on nature for survival. Our entire livelihood depends on a clean and healthy environment. If oil companies come to our territory, they will destroy our environment and our way of life, like they have in so many other places. That is why we will make every sacrifice to defend our rights and territories and keep oil in the ground in the Amazon. What is happening in the Amazon is happening all around the world, from Sarayaku to Standing Rock. My questions to you, to all the world leaders and climate negotiators: Will the world be on our side? Will the world support our struggles, or will the world stand by and silently watch when our governments force the military on us and create false organizations to divide us, while they beat and torture our leaders and put our people in jail, because we are keeping fossil fuels in the ground? Our answer to Nina: we will not! 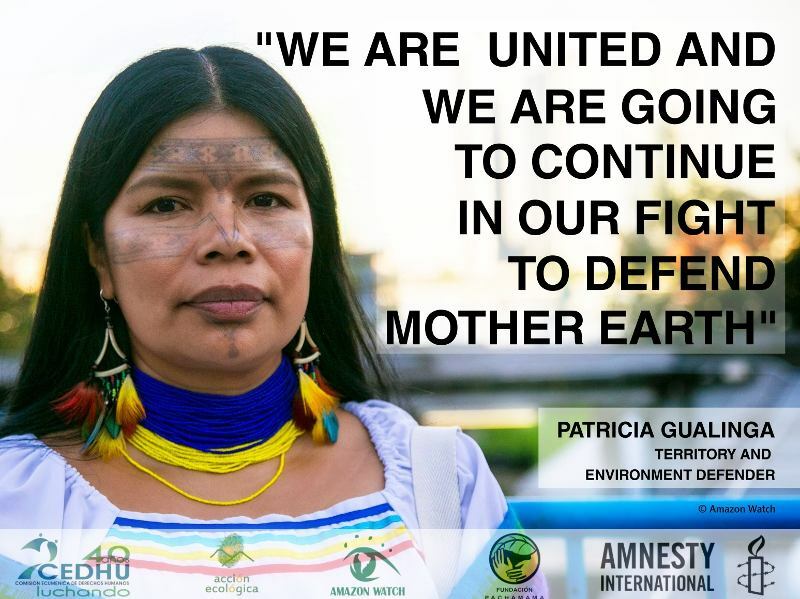 We will stand with you in defense of the Amazon, indigenous rights, territories, and our global climate. We will stand with all indigenous peoples from Sarayaku to Standing Rock who are committed to defending water, rights, and sacred places by keeping fossil fuels in the ground and we ask you to join us. Now is the time to build unity and alliances across borders, sectors, regions and movements to call for climate justice! We will not let Trump or anyone else stand in our way of defending our climate, our rights, or the Amazon. Join us in calling for an end to Amazon crude and to keep all fossil fuels in the ground to avert climate chaos! 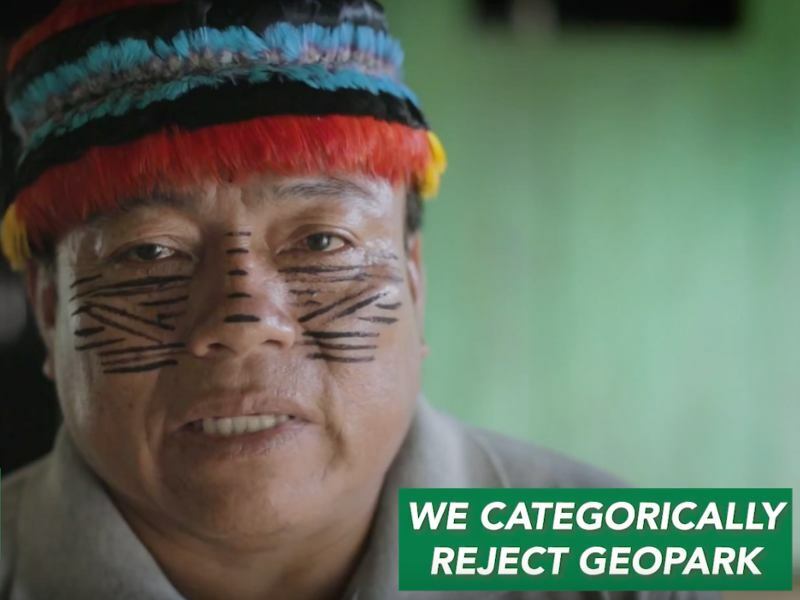 Remember, to avert climate chaos we must protect the Amazon and to protect the Amazon, we must defend indigenous rights, as they are the best defenders of their rainforest territories. Let's stand with them and let's stand in unity to build our movement for climate justice! We're not giving up on our climate, our communities, and Mother Earth! Our future is depending on us!